Tonight's dinner, Snow Pea and Soba Noodle Salad with Thai Peanut Sauce, was quite quick to make, coming in just under about 20 minutes. Dressing this cold salad is a cool mixture of coconut milk, crunchy peanut butter, brown sugar for a light sweetness, soy sauce and red curry paste for a hint of heat. The snow peas for the salad are briefly cooked by adding them during the last minute or two when you boil the buckwheat noodles - both are then rinsed under cold water to immediately halt the cooking. 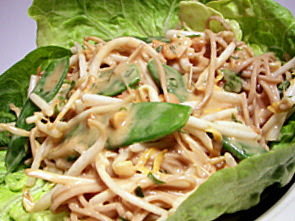 Once the noodles and peas are dressed, plump mung bean sprouts are tossed into the mix adding a mildly sweet crunch. The mixture is then set upon tender butter lettuce leaves to serve. I didn't have any handy, but sliced red peppers would bring a pop of color and another fresh texture to the salad. I thought this was pretty good - not one flavor dominated the dish and I loved the nutty dressing... however, can you sense the "but" coming? There was a little debate tonight about this dish - while Jeff thought the flavor was good, he was unfortunately not very thrilled at all with the texture. He commented that it was the slippery sauce combined with the softer soba noodles that just didn't work and made it a little unappealing for him. I think he might have liked this better if it was made earlier and allowed to sit in the refrigerator for a few hours so the noodles could drink up a bit more of the sauce - but, he can be finicky! When I'm searching through our cookbooks and recipe piles looking for the next Wednesday Treat Day recipe to make, I also have to keep in mind what the resulting yield will be. I try to make enough so everyone who wants gets a chance to try them or take a couple treats home to share with their family. When it comes to recipes that don't make a lot, I will either double it or make two different recipes, but keep in the same "family". So, when Jeff mentioned he thought it would be nice to bring in muffins, I decided to make two different recipes in the interest of variety. 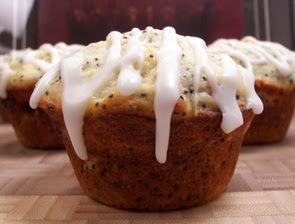 For this first recipe, Lemon Poppy Seed Muffins, be sure to get the freshest poppy seeds that you can - because of their oils, the can go rancid quickly if you don't store them in the freezer. The first step in this recipe is a little unique - using your fingertips, you rub the lemon zest into granulated sugar to evenly distribute the zest and infuse the batter with the first layer of lemon flavor. Sour cream added to the batter gives these golden muffins a wonderful tender texture with fresh lemon juice adding the next layer of lemon. 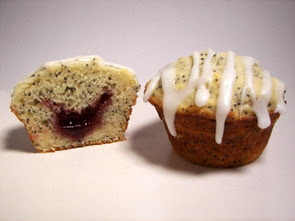 We wanted to make these a little more special, so we added a dollop of raspberry jam inside the batter before we completely filled up the muffin cups. You could change that up and make some with blueberry jam or even use lemon curd to keep the lemon theme going. Unlike the next recipe, this one only needs a couple bowls and a whisk/wooden spoon to mix together, so it comes together a little more quickly. 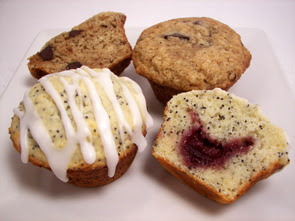 If you are like us and prefer a light "crust" to the outside of muffins, forgo muffin liners and just lightly coat the muffin tin with nonstick spray - otherwise use muffin liners. Once cooled, we added the final layer of lemon with a sweet drizzle of confectioners' sugar mixed with tangy fresh lemon juice. Today's second adventure in muffin baking was a recipe for Banana Chocolate Chip Muffins. This muffin follows a more cake-like way to mix the ingredients as softened butter is creamed with the sugar first. With yet another excuse to let bananas turn dark and ripe, I may need to seek out those cheap bags of "too ripe to sell" bananas at the market and store some in the freezer. I think this is even the third recipe in just a few days that uses them! Tall and moist, these have a strong banana flavor with a hint of spice coming from fresh grated nutmeg along with a dash of allspice. 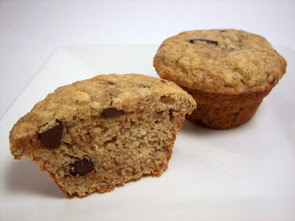 Ample amounts of bittersweet chocolate chunks are distributed throughout each muffin, which is always a good match to bananas. If you want a bit of crunch to these muffins, toss in a couple handfuls of toasted chopped walnuts or pecans. Our cookie recipe section keeps growing and we have yet another one to add to it with these Sweet and Salty Peanut Chocolate Chunk Cookies. We've made a sweet and salty cookie before, but these are a not quite the same in taste and texture. If you just glance over the recipe, you may be wondering "huh? salty? where from?" as the first few ingredients are unsalted butter and unsalted peanuts... but just a 1/2 teaspoon of coarse sea salt makes a big difference. Unlike other salts, sea salt tends not to melt into the mixture, leaving nuggets that add little salty bursts throughout these bumpy cookies. To enhance the nutty flavor, the chopped peanuts are toasted and cooled before being added to the dough - I also used chunky bittersweet chocolate for another layer of sweet against the salty. As they bake, the little pieces of dough grow into fairly large (just over 3") thin cookies that come in just under 100 calories per cookie! 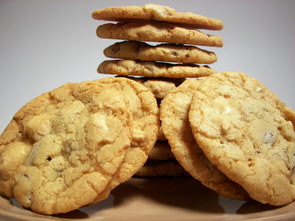 If you take the cookies out while they are mostly blonde with a golden tinge on the edge, they will cool to have a crisp outer ring with a dense chewy center. If you leave them in for another minute or so, they will be more crisp throughout, but will still have some chew to them. While you could spend the extra money and buy pre-made refrigerated packs of cookie dough (with lots of funky ingredients in them), why not just make a batch or two on the weekend, freeze the individual balls of dough and bake off these delicious light homemade cookies whenever the urge strikes? Since we are still fairly new to the world of chili making, it has been fun to try out all these different recipes since we don't have a set preference on what makes it "chili" to us. Tonight's recipe has the interesting addition of a whole grain - wheat berries! This meatless recipe, Zesty Wheat Berry-Black Bean Chili, is filled with black beans, fire-roasted diced tomatoes, onions, sweet red bell peppers and minced garlic. Along with chili powder and cumin, chipotle peppers added to the mixture bring a dark and spicy component to the chili - we used two peppers, but you may want to reduce it to one (or even removed the seeds) to enjoy the flavor more without the extra fiery dose of heat that we tend to like. The chewy wheat berries that are added have already been cooked so it does not take too long to make - if you have never cooked them before, I did post a simple guideline on how to cook them below, and it is also linked in the chili recipe. 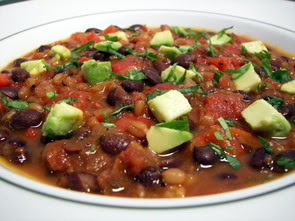 They add such a hearty texture to the chili and help to stretch out the recipe for larger servings. Just as the pot is taken off the heat, lime juice is added for a fresh kick and to bring out the flavors. Sometimes we top chili with cheese or sour cream, but this time just a few pieces of creamy chopped avocado add a rich satisfying finish. Back in the groove with 13 new recipes this week - our favorites this time were the Cocoa-Peanut Butter Crisscrosses, Roasted Red Pepper, Chicken Sausage and Smoked Mozarella Potato-Crust Pizza, and the Tomato and Sausage Risotto. Sunday morning is our grocery shopping day and we didn't know if we were going to be able to go today as an impending ice storm was suppose to happen. We woke up to only cloudy skies and by the time we left it it was just beginning to snow. About halfway through our trip, the snow really started to become heavy and it took us about an extra 30 minutes to get home. So, instead of this large ice storm they were calling for, we got lots of bright white heavy snow! We are very happy it was not ice again like last week - but it is going to be a pain to get things shoveled! 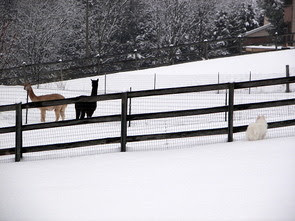 As you can see, the Alpaca's and Max are certainly enjoying their time in the snow! What else is there to do when the weather is like this but get some baking done, right? We went for something a little smaller this time and made these King Cupcakes. 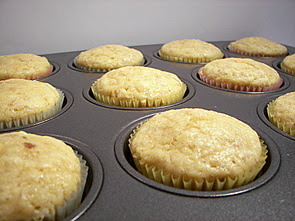 The cupcakes baked up with a fine crown and a moist mildly banana-flavored inside that makes for an ideal foundation for a heaping pile of sweet frosting. 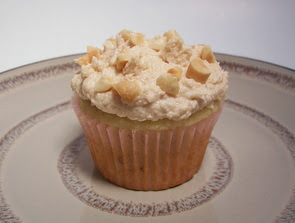 And what would be a perfect match to a light banana cupcake than a generous amount of a creamy peanut butter frosting? Sort of like a buttercream, this frosting is a bit lighter as it is cut with cream cheese. The texture is not as dense - it is more airy with a mousse-like feeling to it, but the peanut butter adds a bold decadent footprint so you know exactly what it is by just smelling it. I was going to pipe the frosting on, but thought we would just keep it kind of fun and whimsical with a small off-set spatula. However, because of the lighter texture, it didn't spread as nice as I had hoped. While we are quite pleased with the flavor in the frosting, we did think it could be tweaked a bit to achieve a little better texture for spreading. Chopped peanuts add crunch and another dimension on top of each individual cake - here they are in their little carrier with no place to go... I guess that just means we get them all to ourselves! Woo! One of our friends dropped by (Hi Louisa!) so she could see the updates going on with the house and we could also finally meet her new baby. Since she had a fairly long drive to come see us, we thought it would be nice to bake her something to take back for her family to enjoy - of course we did make two so we could try it as well! Bring out your extra ripe dark bananas and lets get baking! 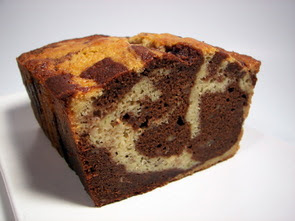 I love the visual effect that recipes like this Black-and-White Banana Loaf have after they've been baked and sliced. There are a couple things that set this apart from your every day banana bread - the first would be the addition of lemon zest and juice that adds a bright and clean tang to the mixture. The fresh grated nutmeg lurks around and you don't necessarily notice the flavor, but then it kind of ambushes you after the first couple of bites. Also added to the mashed bananas is a shot of dark rum that I found to push the banana piquancy to the next level. 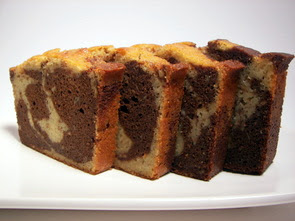 The banana batter for this loaf needs to be separated as one half is merged with bittersweet chocolate that has been melted and smoothed out with a couple tablespoons of butter. Being a dense loaf, it took quite awhile to bake - almost 90 minutes, so be sure to watch the top as you near the one hour mark. If needed, add a foil tent on top to keep it from darkening too quickly. This gorgeous loaf rose quite high and remained exceptionally moist on the inside. 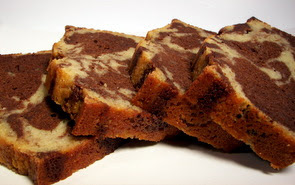 Besides the dramatic color difference in these clean slices, the plain banana side matched sufficiently to the slightly sweeter chocolate swirls without one trying to dominate the other. What could be a more classic pair of comfort foods than meat loaf and mashed potatoes? However, the two that we made for dinner tonight are not necessarily your typical recipes. Instead of plain ol' mashed taters, we added a smoky flare to these buttery golden spuds with a recipe for Mashed Potatoes with Cumin-Lime Butter. Softened butter is mixed together with cilantro, shallots, fresh lime juice, ground cumin and toasted cumin seeds to forge the smoky aspect. Once the Yukon gold potatoes are tender and drained, be sure to put them back in the hot pot so any water left on the potatoes can evaporate and dry them out a touch. Out of our preference, I left the skins on and used a potato masher to cream out the potatoes, but feel free to peel them and use a mixer if you want an ultra creamy texture. Mashed with buttermilk to add a mild twang, each heaping mound of the potatoes is given a dollop of the herbed lime-y butter mixture - this way you can add as little or as much to your taste, rather than adding it to the entire batch. Inside tonight's main dish, Salsa Meat Loaf, is a bounty of grated carrots, zucchini, garlic and onions that are bound together with ground sirloin, egg whites and rolled oats. If you wanted to be sneaky, you could finely grate the vegetables so they won't be as visible if you have picky eaters, but I used a coarser grate for a bit of texture. As you mix the ingredients together, be sure to use a gentle hand to keep the mixture light and so you don't over-work the meat. 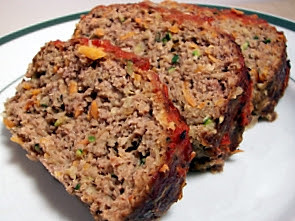 Shaped free-form on a broiler pan (good to let the excess fat drip away), the meat loaf cooks until the top turns brown. A coating of chipotle salsa is then slathered on top and goes back into the oven to finish cooking. The total time it takes to bake will vary depending on how thick your loaf ends up - ours was just over 2" high and took a little over an hour. The only change needed I think would be to add a bit more salt - the meat loaf held together quite well, sliced cleanly and was definitely moist. The salsa I used was the one we first tried and liked back in July from Trader Joe's - it brought a subtle heat that kind of crept up on you without masking the flavor underneath. Hmm... it's not even 15 minutes since we've been done eating and I can't get this thought of a thick hearty meat loaf sandwich out of my mind for lunch tomorrow - is that wrong? Tomorrow morning better fly by fast! We ate dinner a little early tonight, so we were looking for a little something to snack on. My freezer supply of baked goods is getting low (Ooh... I smell a baking spree! ), so I went looking through my recipe stacks, reading titles out loud of recipes that could be done somewhat quickly, and when I hit this one Jeff said "Yes, stop looking - make it!". We love the salty-sweet combination and when you add some fire into the mixture, we couldn't pass up this recipe for Maple-Chile Popcorn. 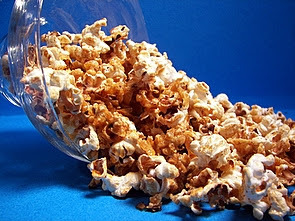 It called for 8 cups of popcorn, but it has been ages since we have actually made it on the stove so I had no kernels on hand - I just popped up a bag that we got as a sample during the re-opening of The Common Market and it ended up being about 10 cups. We heated pure maple syrup, butter, salt and red pepper until it boiled for a couple minutes and then streamed the mixture over the popcorn. It goes into the oven to dry and crisp back up and after it had a chance to cool (it didn't take long at all), we each took a handful. The first couple bites brought a mild sweet maple flavor, but then we both looked at each other as our mouths ignited in an intensely hot, but pleasurable, burst of heat. I recommend reducing the cayenne if you can't take spicy food, but for us it was just right with the sweetness quelling the fire some. Even though our eyes were beginning to water, we couldn't keep our hands out of this incredibly addictive snack. When we have made risotto in the past, the liquid we add is usually in the form of chicken stock. 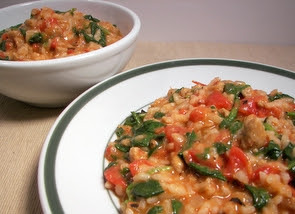 In tonight's dinner, Tomato and Sausage Risotto, we warmed together fire-roasted diced tomatoes (with their juices) and water instead; this method ensured that the tomato flavor is infused into the tender grains of arborio rice. You will also find ample chunky bites of hot Italian turkey sausage spread throughout the creamy mixture. 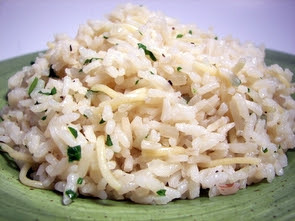 The rice should be just tender when it is ready, so you may not need to use all of the warmed tomato liquid - give it a taste when you think it is close, instead of going strictly by the time, so you don't try to force too much in and leave the rice mushy. Parmesan cheese adds a sharp layer to the creamy texture with fresh chopped spinach stirred in off heat to slowly wilt into the steamy mixture. For a final indulgent touch, we laid a couple pats of butter on top to let the richness ooze into the risotto before we began to portion dinner out. When I was preparing the menu this week, I didn't put down a side for tonight's dinner, thinking we would just have some baked tortilla chips. But since I had a little bit of extra time before I had to start making dinner, I thought we could make some homemade crackers instead! I chose crackers as you don't need to wait on rising times for the dough and they are fairly quick to bake. This recipe, Crispy Rye Crackers, is once again from what is quickly becoming our most used cookbook lately -the King Arthur Flour Whole Grain Baking book. As I've mentioned before, Jeff loves rye bread, so this is one recipe I've been anxious to make since I went through the book. 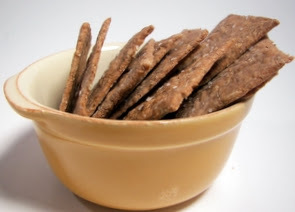 With ingredients such as whole rye flour, cocoa power, caraway seeds and molasses in these crackers, it's no wonder that Jeff immediately said "Woah, they taste just like rye bread!" as soon as he took his first bite. Cutting cold butter into the flour gives the crackers an amazing light texture while allowing them to crisp up as they baked. The dough was relaxed enough to roll out thinly, without having to wait for it to rest - do be sure to keep it moving and floured underneath so it doesn't stick. 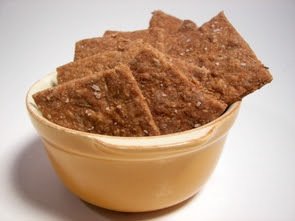 If desired, feel free to sprinkle a few grains of coarse on the crackers before baking them. The dough is pretty dark, so it was a little hard to tell when they had sufficiently browned - when they are close to being done they will emit that classic rye bread aroma and be fairly firm. They will have some bend to them as they come out of the oven, but they will acquire that cracker-like consistency as they cool. For tonight's dinner, we got to use one of our new favorite ingredients in this Quinoa Curry. In previous recipes we have toasted the quinoa to bring out its nutty flavor, but this time we just rinsed them to remove the bitter coating so the rest of the ingredients could stand out. The quinoa was meant to be a mild background like white rice would be in this dish. We cooked this seed/grain like we would pasta; this way you don't have to fuss with how much liquid to quinoa you need and we could heat up the baby frozen peas by simply draining the boiling mixture over them. As the quinoa cooks, fennel seeds, cumin seeds, curry powder and hot madras curry powder are quickly toasted in a touch of shimmering peanut oil. The sweet fragrance quickly filled the kitchen - we then added vegetable broth and turmeric followed by an abundance of ivory cauliflower florets. Left to cook just until crisp-tender, the cauliflower is assimilated by the lustrous golden tone given off from the turmeric. Plain yogurt is tempered with a couple tablespoons of the well-seasoned broth and then added back into the cauliflower mixture to cream out the sauce. 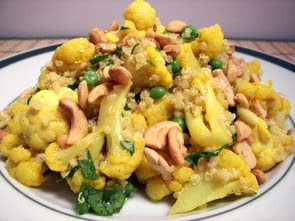 The cooked quinoa, warmed peas, chunky cashews and fresh cilantro are all tossed with the cauliflower mixture to serve. I think Jeff was a little hesitant to try this dish, but that faded after his first few bites... he hastily finished his plate and tried unsuccessfully to take a couple forkfuls from mine! The spices made this dish, though I thought it would have a bit more heat to it than it did. The quiona absorbed much of the tangy sauce so the mixture was pretty thick... I thought that the salty pieces of cashews were the right choice for nuts and the amount was very liberal per plate. 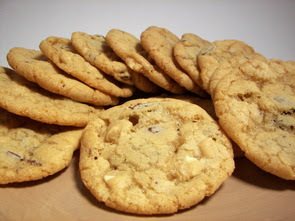 Since we are back on our regular schedule, today we get to talk about what we baked for the Weekly Wednesday Treat Day treats Jeff will bring in tomorrow to share with his co-workers. 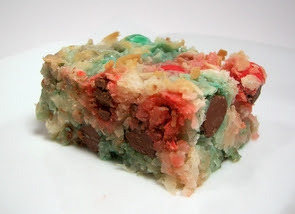 We took a different look at coconut macaroon cookies and turned them into a different shape with these Tie-Dyed Macaroon Bars. I've been wanting to find another use for these new candies (well not so new anymore I guess) that we have been enjoying since they came out in late '05. These thick dense bars are quite simply made from shredded coconut, sugar, flour, egg whites, eggs, almond extract and the candy-coated kisses. After they are baked until the top is a light golden, they need to rest overnight so the sweetness can mellow and allow the moisture evenly spread out. This also makes them a snap to cut into clean little rectangles. 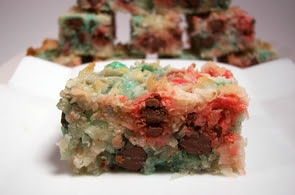 The "tie-dye" effect happens as the colors from the candies slowly bleed into the stark white coconut and create little bursts of colors around each kiss. The milk chocolate brought a rich dimension of sweetness, although I think I might want to try these again with the dark chocolate version of kissables. I was worried they might be too sweet since we used already sweetened coconut, but we were happily surprised as we did our required quality control - so don't be tempted to skip the overnight rest! Each bar is very chewy with a pleasant and light almond flavor that lingers in your mouth after every bite. We cut them into 35 pieces, but I think you could go even smaller and still be satiated after having one. Tonight's dinner, Tortilla Lasagna with Swiss Chard, would probably have been better done on a weekend as it took a lot of dishes and quite a bit of prep work before we got it in the oven. This is also our second time having swiss chard - this time we used the red variety instead of the rainbow-colored bunch we used before. I love how it has a more substantial texture than spinach, while still having a mild flavor. We made this dish in a large 10" springform pan for easy removal and layering - I'm sure you could use a casserole dish if you don't have one of these pans already. The stems from the swiss chard are separated from the leaves and softened with the onions as they are a bit more tough and take longer to cook. The leaves and garlic are added to the mixture and they cook down until the leaves turn tender. 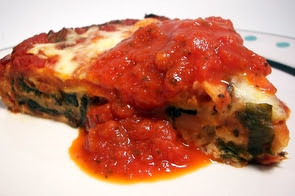 The layers are made from white corn tortillas, marinara sauce spruced up with torn fresh basil leaves, the chard/onion mixture, ricotta cheese simply seasoned with salt and fresh ground pepper, mozzarella cheese and grated Parmesan. As this monster lasagna cooks, covered, the tortillas absorb the moisture from the marinara sauce so the mixture can hold together, but keep some of their firmness and don't turn to mush. The cover is removed when it is almost done and a scattering of mozzarella and Parmesan is placed on top to add one more cheesy layer. When you pull this out of the oven, make sure you give it enough time to set up so you can get clean cuts - we waited about 10 minutes before removing the sides to reveal the impressive pie. While I don't think I would classify this as a dry dish, there is enough extra marinara sauce called for that you reheat and serve on the side if you like things a bit saucy. 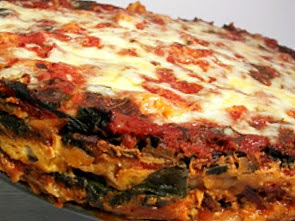 There are a lot of ways that lasagna can be made and this is one that deserves a try - worth the extra effort and time it takes to make! When we woke up last week after the big snow/sleet/ice storm, we stepped onto the driveway to begin clearing it, only to discover it was one large sheet of frozen snow that would not budge. We do have a little plow on front of the riding lawnmower, but in no way was it going to clear the driveway! We didn't know how we were going to get it cleared out, but soon after we heard on a knock on the door and it was Farmer Jon's (the family who owns the alpaca's behind us) wife, Colette, asking if we would like our driveway cleared, by chance. We looked and saw he was on his big tractor - no way we were going to turn down that offer! They kindly didn't ask for any payment, but I thought we needed to do something - so I made these Cocoa-Peanut Butter Crisscrosses for Jeff to bring over. It makes a fairly large batch, so we decided to share some with our other neighbors John and Loree. This may be my new favorite way to make peanut butter cookies! 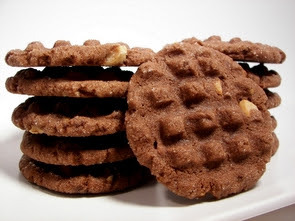 To choco-fy these peanut cookies, we replaced a portion of the flour with Dutch-process cocoa and added in some finely chopped bittersweet chocolate. 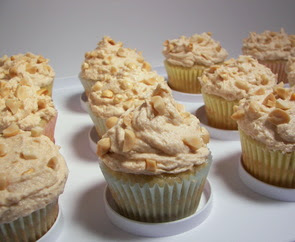 I used a smooth peanut butter (processed, not natural) and added a generous cup of salty chopped peanuts. The cookie dough was soft, but not sticky, so you could easily roll them into balls with your hands. To give them a bit of a crunch and sparkle on the outside, the balls are rolled in granulated sugar before you make the crisscrosses on top. Instead of using a traditional fork to flatten the dough balls, I used a potato masher so the grooves would be a bit bigger and make for a more unique appearance. You can control the texture a little by how long you bake them - if you want a more crunchy all-the-way through texture, use the longer time - however if you want the centers to be a little chewy, bake a little shorter and leave them on the sheet until they firm up enough to move them. They bake up into large cookies with a strong peanut butter taste and just enough chocolate flavor shining through - they are a bit salty, sweet and crisp... all of our favorites wrapped in a delicious package. Tonight's dinner is not only a mouth-full to say, but a new way to enjoy pizza! Roasted Red Pepper, Chicken Sausage and Smoked Mozarella Potato-Crust Pizza has a base of potatoes that have been slightly pre-cooked, shredded and tossed with olive oil, oregano, crushed red pepper, salt and black pepper. This mixture is spread out over a 12" pizza pan and bakes until the potatoes are tender and beginning to turn golden and crisp up on top. Now, I'm not trying to fool you and say you will end up with a thin-crunchy crust ala pizza dough - however, the outside does get a bit crispy with the insides staying warm and fairly moist. You could probably leave it in the oven and let it dry out even more, but I don't think I would have liked it nearly as much if we did that - we thought it needed to stay on the tender side so the flavor is not compromised. 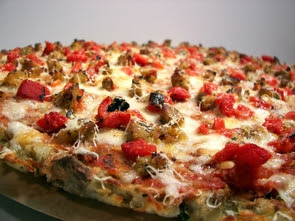 Once pre-baked, we topped it with marinara sauce, smoked mozzarella, diced sun-dried tomato chicken sausage (that I crisped up in a skillet), chopped roasted red bell peppers and a shower of nutty Parmesan cheese to finish. The smoky cheese was able to stand out and be heard against the canvas of the mild potatoes. I was going to forgo the chicken sausage to keep it more clean, but I'm glad I added it... besides adding another layer of flavor, we thought the sausage added to the "pizza" aspect without the need for a doughy crust. Hearty servings that are actually not too caloric made for a filling dinner, with a light salad on the side. No pastry to top your savory pie? Here's a solution! What a busy week in the kitchen - we went through 14 new recipes... whew! It was hard to narrow down some favorites, but I think we would choose the Dark and Dangerous Cinnamon Buns, Peanut Butter-Chocolate Chip Waffles, Chocolate Whoopie Pies, and because we should include something that was not a sweet... the One-Dish Barley, Wild Rice, and Chicken Pilaf as well. 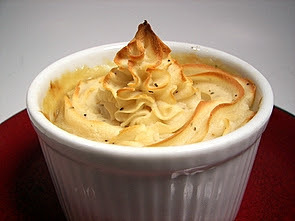 Tonight's dinner was certainly one of comfort as I made individual Turkey Pies with Mashed Potato-Asiago Topping. Underneath a generous pile of mashed potatoes is a creamy combination of onions, shallots, baby green peas and chopped turkey with the mixture being seasoned with fresh sage and parsley. 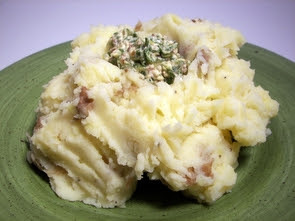 I made a batch of mashed potatoes just for this recipe, but it would work great with leftovers or even the pre-made ones you can find in the stores if you are running short on time. To pep up the potatoes, shredded Asiago cheese and seasonings are added before you pile them on the filling. If you are using leftover potatoes, be sure to check for seasonings as it may not need any depending on how you flavored them originally! The pies are assembled in ramekins for easy portion control - once filled, they go in the oven until the filling is thick, hot and bubbly. As the potatoes heat up, they formed a crusty golden cover that I could have probably eaten just by itself and been content for the evening! Yes, the title really fits with these buns! Yet again I delved into the King Arthur Flour Whole Grain Baking book today as I have had my eye on a recipe for Dark and Dangerous Cinnamon Buns since I first flipped through it. Because of the time needed for the recipe, I decided I better wait for a free weekend to attempt them. Once the ingredients for the dough have been mixed together, it is left to sit, before you begin the kneading process, so the flour can absorb the liquid and let the yeast get a head start as it is filled with whole grains. Once it had time to rest, kneading the dough seemed to go much quicker and I hardly needed any flour to keep it from sticking to my hands. The use of potato flakes and dried milk gave the dough a soft and smooth texture so it was easy to tell when the dough was ready for its first rise. The filling for the rolls is a little different - you don't need to smear the rolled out dough with softened butter! 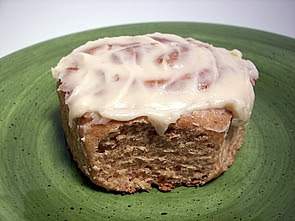 Instead, robust dark brown sugar and quite a lot of cinnamon are made into a paste with the addition of an egg white. 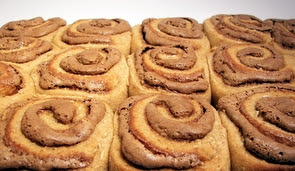 As you go to roll the dough into a log, be sure not to roll it too tight - this will give it some room to expand as it rises and the center of the cinnamon buns will not shoot up when baked. While you can use a serrated knife to portion out the dough, I have always found that the easiest way is with unflavored dental floss - this way you don't risk smooshing the filling out or squishing the dough. Once baked, the rolls are slathered with a tantalizing creamy vanilla frosting - we wanted to have a fairly thick layer on top, so we let the buns cool down a bit before we frosted them. If you want the icing to melt and seep into the cracks dispersing the rich sweetness throughout the inside, be sure to spread them while they are fairly warm. If I didn't already know what these buns were made of, I would have never guessed it was 100% whole grain. A wonderful bonus comes with having so much honey in the dough - they will keep their freshness for several days if you keep them well covered at room temperature! I know what I'm having for breakfast tomorrow (and dessert!). As you've read before, Jeff claims to not care at all for mushrooms - but every once in a while I will set aside a recipe that includes them to try and prove him wrong. 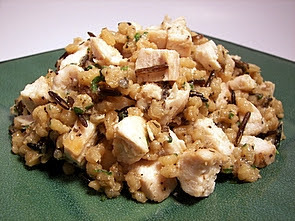 Tonight's dinner, One-Dish Barley, Wild Rice, and Chicken Pilaf, uses dried porcini mushrooms which I even bought in front of him at the market... he gave "the look" and told me to have a back-up ready as he was sure he would not like whatever I was making. The dried mushrooms are re-hydrated in a bowl of hot water while you prep the rest of the ingredients. This dish is composed of onions, garlic, pearl barley, wild rice, fresh thyme, chicken broth, chunky pieces of cooked chicken and fresh grated Parmesan cheese. While it does not have that lush creaminess that risotto has, it is in a way similar with the cheese stirred in at the end to imitate that velvety texture - you then get the benefit of not having to stand at the stove and stir. Tender barley brought a hearty chew to the dish with the onyx rice lending a subtle nutty flavor. The soft porcini mushrooms brought roots to the pilaf with a mild earthy flavor and blended in well - so well in fact that after Jeff proclaimed this recipe as gratifying and delectable. I then got this big grin on my face and said "Haha... guess what you just ate!" After a second he realized this was the mushroom dish he was originally trying to veto and with a scrunched up face said "but... but... I don't like mushrooms!" Well guess what - maybe you do! Slowly, but surely we are branching out and finding we do like ingredients that would have never come across our plates a couple years ago! Finally we get to talk about what we made for the Wednesday (well... Thursday this week!) Treat Day! It was going to be perfect since it fell on Valentine's Day, but alas the weather had other plans... Jeff's office was closed yesterday, but he probably could not have even gotten out of the driveway to go in anyway! 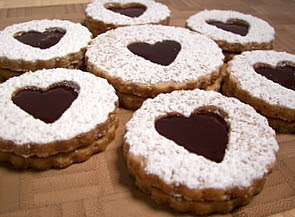 I used a little heart-shaped cookie cutter for these Linzer Sables to fit in the holiday, but you could use anything you wish - you don't even have to cut out the center if you don't feel like it! I did hold the dough in the refrigerator until yesterday afternoon, so the cookies would be as fresh as possible since Jeff would not be able to bring them in until this morning - it didn't seem to affect the results at all! After the dough is mixed, I liked how you could still see the speckles of finely ground almonds - if your are like me though and don't feel like paying the price for almond meal, you can make it yourself. For a layer of safety, I borrow a tablespoon or two of the sugar from the recipe and add that to the food processor when I grind the almonds down. The sugar will help to absorb the fat released from the almonds and give you a chance to get the almonds to a good consistency without turning the mixture into almond butter before you have a chance to stop. To fill these buttery cookies, raspberry jam is brought to a boil with a bit of water - this will thin it down to remove any lumpy bits and make the spreading much faster. We sifted confectioners' sugar on top on the cookies that had the center cut out to make a striking contrast to the dark burgundy colored filling. These cookies have a bit of spice to them from the addition of cinnamon and ground cloves in the dough which was a nice change of pace. 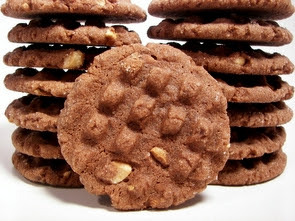 If you want to take these one step further, I think using ground hazelnuts instead of almonds and filling the cookies with nutella would make for a dangerous and decadent combination. For a side dish tonight, I made a recipe for Moroccan Carrot Salad. For how easy this was to prepare, it definitely had a lot of flavor going for it. Another recipe that highly benefits from toasting a few of the ingredients first - we heated chopped walnuts, whole cumin seeds and whole coriander seeds until their strong scent began to release and they turned a light brown. 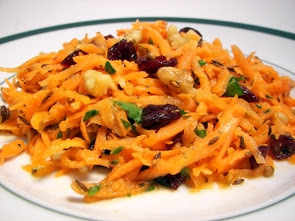 The toasted nuts and spices are then mixed with a combination of grated carrots, fresh lemon juice, apple cider, olive oil, dried cherries and chopped cilantro. A strong smoky background gave way to the fresh sweet and tangy flavor from the dressing and carrots. The dried cherries added a pop of color and a chewy texture to compliment the crunchy seeds and nuts. I didn't know if the seeds being kept whole would overwhelm the light salad when you bit into a few of them at once, but we thought it was just a mellow rush rather than an explosion of flavor. This is one to throw together at the last minute if you find yourself looking for a savory and quick side dish. Tonight's main dish, Basmati Pilaf with Vermicelli and Onions, was probably intended as a side dish, but once again we just increased the portion size a bit and found it to be very filling. I have to say, this was the easiest and least fussy way we have ever cooked rice! I thought it was interesting to cook, let alone serve, rice and pasta together - but it worked very well here. Delicate basmati rice and broken vermicelli are added to softened sweet onions and cooked until the rice begins to turn opaque. Chicken broth is added and once it comes up to a boil, it is covered and placed in the oven to bake for 15 minutes. When the timer is up, it is taken out and sits for 15 more minutes (no peaking or stirring please!) until you open the pan up to find light and fluffy rice with tender, but not mushy pasta. How much easier could that get... no messing around with the heat on the burners, no worries about boil overs and no burnt rice on the bottom! Refreshed with fresh parsley and green onions before serving, I'm looking forward to having this take on arroz con fidellos for lunch tomorrow! This morning I wanted to surprise Jeff with something a little special for breakfast - so I woke him up with the aroma of fresh Peanut Butter-Chocolate Chips Waffles from the King Arthur Flour Whole Grain Baking book today! I got the dry ingredients mixed up last night and it only was a few minutes of prep time this morning to get things going. The only lengthy part of this recipe was waiting for the batter to rest - since this is a whole grain recipe and uses spelt flour, it takes a few additional minutes for the flour to absorb the liquids. When you take them right off the waffle iron, they will be a little soft - but they crisped up as they quickly cooled. 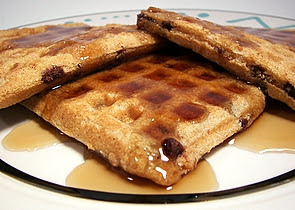 I used chunky peanut butter for an additional crunch and mini chocolate chips as I find they get a better distribution throughout the waffles. Jeff got a big smile on his face when he took his first couple bites and said "Wow! It's just like eating a big chocolate chip cookie with peanut butter on it!" We don't have it very often, but Jeff really likes dishes that include shrimp - I tend to save recipes that involve them and give 'em a go on special occasions. So for dinner tonight, I went with a recipe for Creamy Gruyère and Shrimp Pasta. It's pretty hard to go wrong with good cheese, pasta and shrimp! As the little ears of pasta (orecchiette) cooked, we made a creamy cheese sauce from flour, milk and a mildly sweet Gruyère cheese. When that was ready, we sautéed shrimp and fresh garlic in a pat of butter with a shot of white wine and cayenne pepper mixed in just before the shrimp are done. 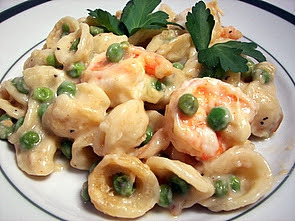 The pasta, sauce and shrimp are tossed together with green peas and placed in a baking dish. A smattering of Gruyère is placed on top and the mixture goes into the oven to bake until the cheese has a chance to melt and begin to turn golden. This was a very creamy and hearty dish - I would definitely be sure to taste it and check for seasonings before it goes it the oven as I thought it needed a bit more salt and cayenne when I tasted. It was also fun to use a new shape of pasta - I loved how some of the little ears were filled with puddles of the cheesy sauce! We ended up having to search 3 stores to find one that actually carried it this type - the only brand we ended up seeing was De Cecco. 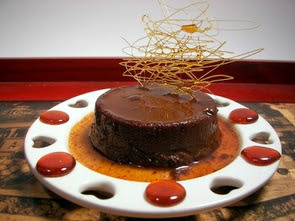 To keep the theme of special treats going, I made a Chocolate Crème Caramel for dessert - something I have never made or eaten before! 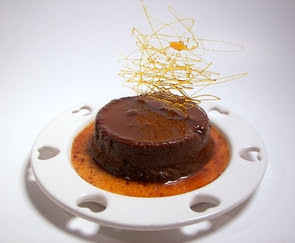 This rich chocolate custard sits on a dark caramel syrup and is baked in a water bath to achieve its firm, yet silky texture. Making the caramel was not nearly as difficult as I thought it would be - you just have to be on your toes when it begins to change colors. I'm not sure if it turned out correctly as we have never eaten one to compare it to, but this had an intense chocolate flavor that was like magic against the sweet sauce. When I flipped the ramekin over, it didn't come right out - but with just a little coaxing to let the suction give way, it went right on the plate followed by it's own little amber pool. I did have a little extra caramel leftover, so I decided to play around to make a couple decorations to add on top! A handful of ingredients that are commonly in your kitchen and a few minutes of your time can easily turn out this delectable dessert that would work well for an special occasion, or "just because". Puppy treats, potatoes and pork... oh my! Uh oh... I know Tuesdays are the day we talk about the treats for Wednesday Treat Day, however this wicked weather outside will probably keep Jeff at home tomorrow. Most of his co-workers left early today, so he followed suit and came home around 12:30. They are saying we could get over an inch of ice overnight - it will be such a mess tomorrow if we do! I did make the dough for the treats today though, I just won't be able to finish with them until tomorrow or early Thursday morning. I'll get them posted on Thursday - assuming we have power and everything! One of Jeff's co-workers (Hi Kristen and Family!) 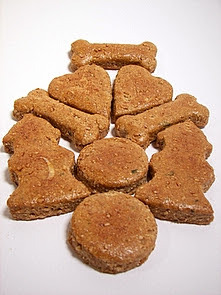 just adopted a new puppy last week - I thought it would be nice for Jeff to bring in some homemade doggie biscuits to celebrate. We also shared a few of these with another co-worker (Hi Ching!) that often brings Jeff treats she experiments with for us to try out. 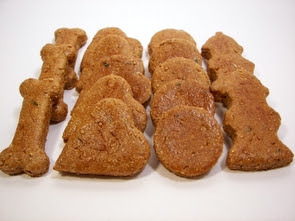 These Beefy Biscuits are a little different than the other treats that we have made - they are a bit more crunchy and have a surprise ingredient to really add flavor to them... baby food! The dough is pretty flexible and well seasoned with minced garlic, beef broth and parsley. I didn't list a full amount for the whole wheat flour because it will depend on where you live as to how much you need. You want to keep adding enough until the dough is stiff and does not stick to your hands while kneading. As you put them on the baking sheet, you can put them fairly close together - they won't expand too much. After about 30 minutes in the oven, we took them out and gave them a brush with an egg wash - this gave a brilliant shine to the golden biscuits. If you want them to be extra crunchy, you could turn the oven off and leave them inside overnight to cool. The side for dinner tonight, Garlicky Roasted Potatoes with Herbs, starts off by heating two full tablespoons of chopped garlic and some olive oil until the garlic begins to turn a light golden. The garlic is then reserved for later with the infused oil being used to coat quartered red potatoes. Simply seasoned with salt and pepper, they are placed in the oven and allowed to roast until tender and they develop an appealing golden exterior. 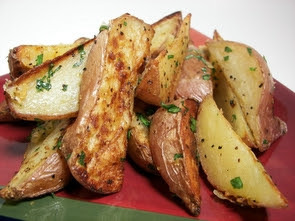 As soon as the roasted spuds come out from the oven, they are tossed with the toasted garlic, chopped parsley and lemon zest - the garlic is a nice mild accent to the lemon zest that perks up the flavor and adds a light zing. What was a little unplanned, but worked perfectly, was that tonight's main dish, Mustard Herb-Crusted Pork Tenderloin, cooks at the same temperature as the potatoes and in just about the same amount of time. 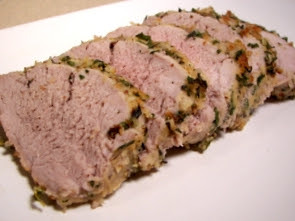 Lean pork tenderloin is coated in a tangy mixture of Dijon mustard, crushed fennel seeds and minced garlic. This combination ensures the mixture of panko breadcrumbs, parsley, grated Romano cheese and fresh thyme stick to the meat and form the crust. Baked until lightly pink in the center, the meat needs a chance to rest for a few minutes before slicing so it has a chance to relax and let the juices re-distribute. The aroma emitting from the oven while the pork and potatoes were cooking was outrageous - it was very hard to stop and take pictures instead of diving right in. The pork was tender, juicy and the sharp cheese brought an interesting nutty taste against the mild sweetness from the crushed fennel. The panko worked well enough, however I think I would cook it on a rack next time - the bottom crust got a little more soggy than I would have liked. Not much else to say except tonight's meal was such a satisfying and comforting way to end a dreary winter day. Jeff came home on Friday and asked if we could make something for a bake sale his office is having for a March of Dimes event. We had a few ideas in mind after thinking about it and decided to make one new recipe along with a classic bake sale treat that we decided to put our touch on. 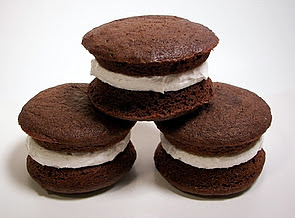 The new recipe, Chocolate Whoopie Pies, is one that I have been waiting for an excuse like this to make. These individual stacked cakes would be considered a traditional Pennsylvania Dutch treat and are pretty common in the north-east. Instead of baking the rich chocolate batter on a baking sheet, I thought it would be fun to play around and try them out in the hamburger bun pan. The cakes baked into smooth perfect round circles and had little feet on the bottom (kind of like a muffin top). I used a 3 tablespoon cookie scoop to portion out the batter, so they were not so big that they would be hard to eat - it was also a good size to fill out the wells in the pan. To assemble the sandwich, we made a sweet frosting that uses marshmallow fluff to give it an ultra-creamy feeling. We each snuck a bite from one last night after we put them together and were a little taken aback with how good they were - however, we decided to wait until today to finish it to find they had developed a fantastic complex flavor. Ugh... why didn't we save more than 1?! We are so making these in a pumpkin version for the fall! 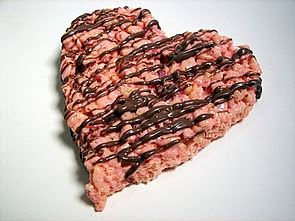 What could be more classic for a bake sale than Rice Krispie treats? Though, we did have to put our own touch to them and hopefully give them an edge in the eye candy department. We used the new Rice Krispies with Strawberries bits in them and also found they have new strawberry flavored (albeit of the artificial variety) marshmallows which gave the treats a beautiful pink hue. I used a large (about 4") heart-shaped cookie cutter and got about 7 punched out from a regular batch. For an added flare, we decided to drizzle the top of each with a little melted dark chocolate. Not too sweet, chewy and a perfect fit with Valentine's Day just around the corner. I knew ahead of time I was going to have a pretty busy day tonight and made sure to plan for a super quick dinner for tonight. Since we are on the beginning edge of a big mess from a winter storm that could be ice, snow or rain (go weather forecasters! 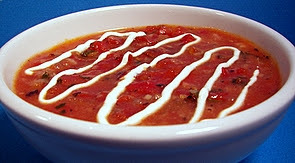 ), I went the warming soup route and made a recipe for Tortilla and Tomato Soup that was on the table in no time. Nothing too special in the preparation - onions, garlic, a couple cans of fire-roasted tomatoes, vegetable broth and corn tortillas are brought to a boil and left to simmer until the tortillas break up into the soup. Fresh cilantro and a couple shots of cayenne pepper are stirred in just before serving to freshen and add just a touch of heat - I did think it could have used a bit more, or maybe tossing in a few crushed red pepper flakes into the mix. For a little pizazz, soft goat cheese and sour cream are mixed together to create a pungent and tangy drizzle (or dollop) on top. Remember I said I had an idea for the leftover hummus cakes from yesterday? They made for a tasty surprise in the bottom of each bowl! A total of 9 new recipes this week with the stand-outs for us being the Oatmeal Brownies, Cranberry-Apple Coffee Cake and the Sesame Noodles with Napa Cabbage that were just as delicious cold the next day for lunch. Dinner tonight takes the flavors of hummus and morphs them into a savory little cake that gets baked in the oven. These Hummus Cakes are started by processing chickpeas, green onions, tahini (if you don't care for this or have a hard time finding it, you can use natural peanut butter), fresh lemon juice, lemon zest, olive oil and garlic in a food processor. Don't puree this mixture smooth - you want it combined, but there should be some chunky texture to it. Whole chickpeas are stirred into this mixture for a bit more substance and mouth feel. As this mixture is a little sticky, I used a smallish ice cream scoop to portion out the mixture and then flatten the balls into patties on the baking sheet. Wet your fingers if you find the mixture is sticking too much when you are forming the patties. These go into the oven and bake until they firm up and a golden shell forms on the outside. 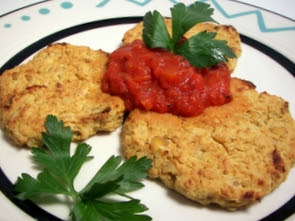 We decided to serve these savory cakes with some chunky marinara and called it dinner - I already have an idea to use the leftovers with tomorrow nights dinner! I also think you could minify these tangy cakes, bake them a few minutes less and turn them into a divine little appetizer. I guess this must be the week for layered treats out here! 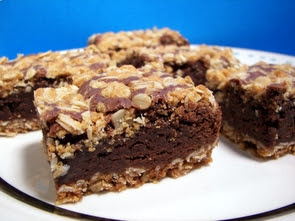 Today's treat, Oatmeal Brownies, is the third this week - sadly, it was not for us to enjoy. Every so often we like to send out random goodies to people - this time we sent these off to Jeff's Mom's work so she and her co-workers at the hospital could enjoy something sweet. 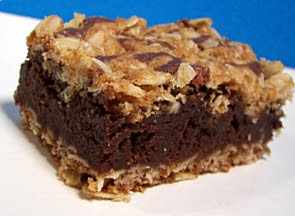 These brownies were a fun project - the base resembles a chewy oatmeal cookie, which you end up setting a little bit of the dough aside, to form tasty golden nuggets on top. The first cookie layer gets a quick pre-bake so it can get a head start and be able to withstand the brownie part. The batter for the brownie layer is pretty typical of most recipes and is happily mixed together in one pot. Once this batter is spread over the cookie layer, the reserved bits of the sweet brown sugar cookie dough are scattered across the top. I was a little unsure how the brownie texture would be as this recipe contained a good amount of flour - we prefer our brownies to be less "cakey" and more fudgy. It killed me to wait long enough to cut them, but once I did, I was happily surprised to see a luscious, dark and dense interior. They were not so fudgy that it was like eating a pan of fudge, but they were also not anywhere near cakey. In addition to the cookie layer, the brownies themselves had a nice chew to them with a crackly finish on top. We both commented that they had a noticeable saltiness to them that helped to cut through their rich sweetness. Besides adding a unique finish to the top, the crunchy golden clusters added a fun playfulness that make them different enough to make you reach for just "one more". Jeff said it was a little unfair that he only got to do his "quality control" check on one brownie and tried to sneak a few out of the packing box... too bad I caught him! Although, I confess I had a hard time parting with them too - maybe I should have snuck a few in the freezer. D'oh!